. The first Somalis arrived in the city in the 6th century and gained control of the city and trade of the region. The rich city later came under the powerful Ajuran Empire in the 13th century. The 13th-century Arab geographer Ibn Sa'id described Merca as the "capital of Hawiyya country". During the 12th century, the cartographer Muhammad al-Idrisi may have referred to the Hawiye as well, as he called Merca the region of the "Hadiye", which Herbert S. Lewis believes is a scribal error for "Hawiye", as do Guilliani, Schleicher and Cerulli. During the Middle Ages, the area was one of several prominent administrative centers of the Ajuran Sultanate. The polity formed one of the largest kingdoms in the southern half of the Horn region. During the Middle Ages, the Merca area was part of the Ajuran Sultanate's realm. The polity formed one of the largest kingdoms in the southern half of the Horn region. Various pillar tombs exist in the region, which local tradition holds were built in the 16th century, when the Sultanate's naa'ibs governed the district. During the early nineteenth century Biimaal pastoralists and farmers were the main inhabitants of Merca. In the 1930s a group of Italian Somalis established residency in Merca. 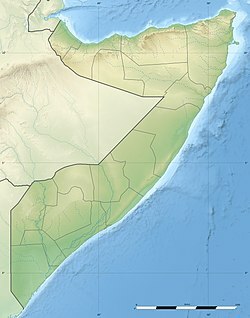 The Port of Merca was the second[clarification needed] in Italian Somalia and was nicknamed the "port of bananas" due to its status as a key exporter of bananas from Somalia to Europe. In the city of Merca there was a huge economical development in the 1930s, due mainly to the growing commerce of the port of Merca connected by small railway to the farm area of Genale. World War II did some damages to Merca. Merca was abandoned by government forces and captured by Al-Shabaab in February 2016. It was recaptured by the Somali National Army along with African Union troops, a few days later. A small battle was fought in which a Somali soldier, several militants, and four civilians died. Merca has a jetty-class seaport, the Port of Merca. The nearest airport to the city is the K50 Airport in the Lower Shebelle province. Although visual art is not popular in Somalia due to prevailing beliefs that it contradicts Islam's proscription on all forms of idolatry, a lot of the known visual art in the country derives from the small historical town of Merca. Known for its beautiful white sandy beaches and orange dunes, the city's picturesque contrast of colors serves as an inspiration for local visual artists. Asha Said Jama, social activist, and former TV reporter and journalist. ^ Kariye, Badal W. (2016-11-27). The Kaleidoscopic Lover: The Civil War in the Horn of Africa & My Itinerary for a Peaceful Lover. AuthorHouse. ISBN 9781452004631. ^ Herbert S. Lewis, "The Origins of the Galla and Somali", in The Journal of African History. Cambridge University Press, 1966, pp 27–30 (not scholarly peer reviewed). ^ "Somali troops 'retake' key port city of Merca from al-Shabab - BBC News". BBC News. Retrieved 2016-02-06. ^ "Istanbul conference on Somalia 21 – 23 May 2010 - Draft discussion paper for Round Table "Transport infrastructure"" (PDF). Government of Somalia. Retrieved 31 August 2013.